Robin Greenstein does musical programs tailored for seniors and special audiences, including hospitals, nursing homes, health related facilities, shelters, special ed groups, psychiatric and senior centers. These programs include Sing-along to Standards, folk music, Patriotic programs and much more. Accompanying herself on guitar, ukelele and/or banjo, Robin sings in English, French, Italian, Spanish, Hebrew, Ladino and Yiddish. For many years she has worked for Hospital Audiences, Inc. performing throughout the five boroughs of New York City. More recently she has been performing for Music That Heals, which brings music to sick children in hospitals, homeless children and juvenile facilities. She has performed for Hadassah, Hatzilu, The Atria, Brookdale, Bristol and The Hallmark at Battery Park City (upscale senior residences), Premier 5 Star Residence in Teaneck, Samuel Field Y in Little Neck, Mid-Island JCC in Plainview, NY and dozens of libraries in the tri-state area. Robin has a B.A. in Music and majored in classical guitar. She also studied American folk music under 60's folk legend Hedy West. Her first job after college was working under a Federal grant to do music research in Sephardic Jewish Music by collecting songs from NYC residents under the auspices of the American Jewish Congress. Robin has sung the National Anthem at Madison Square Garden for the NY Knicks, was a headline performer for the Renaissance Cruise Line, played at Club Med in various locations, and spent 3 months singing at a theme park in Japan. She toured Europe throughout and her work with Martin Guitars took her to mainland China in October of 2002 where she performed in Shangahi and Beijing. She has a lot of experience working with all kinds of seniors, from very active to hospice residents. 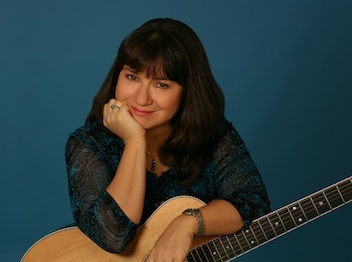 She has released two CDs of original material, two CDs of folk and blues songs about women; a children's music recording and a multi-cultural holiday CD entitled "Songs of the Season." Her latest recording "Tears and Laughter" was a #1 album on the National Folk DJ Charts in 2016. "I wanted to put down in writing how very much I enjoyed your performance for the Clifton-Passaic Chapter of Hadassah on Feb. 21. You knew what the audience wanted and you gave them the music they like. When I am in charge of a program, and we have entertainment, I like to sit in the back of the room to see the reaction of the audience. Well, the reaction to you was wonderful. Everyone seemed to be enjoying your performance. There was a wheelchair-bound woman having such a good time that when her aide came to get her, she was very reluctant to leave. You did good!" "Our school serves children with special needs. As mandated by the the Pre-Kindegarten performance standard, Robin's performance enabled the children to engage in a variety of personal creative movements and functional physical movement individually and in a large group, instrumental in exercising and developing large and small muscles. Our children and the attending adults enjoyed Robin's performance. She encouraged children and adults to get up and participate by clapping, dancing, twisting, jumping and repeating music lyrics." "Thanks so much for the very special music made during our dinner on Sept. 22. The songs were so appropriate for this group of Barnard grads. Your music was so outstanding that some of us just had to get up and dance (not bad for septennarians). You received many kudos from our guests." Theme shows include: Patriotic Program - July 4, Earth Day, December Holiday shows, Valentine's Day show "All You Need Is Love", Passover programs, Purim programs, Women's Month shows, Songs of the Sea, St. Patrick's Day, Veteran's Day, Black History Month, Autumm celebrations, Sing Along to Standards, Celebrate America, etc. Robin offers a tribute to Pete Seeger "The Power of Song". Playing banjo and guitar, she recounts the important milestones of his remarkable life, including the famous songs he wrote as well as the songs he made famous! Seniors who were his contemporaries are especially moved by this program as it touches upon their life stories as well. and many more songs on guitar and banjo at her Youtube Channel. Prices for shows depend on type of venue and distance from New York City. Please contact Robin with any questions.